Kashmiri Roti is a traditional Kashmiri Dish. Speaking about cuisine of Kashmir, they are influenced by Kashmiri Brahmins and Muslims. In contrast to Brahmins in rest of the country, Kashmiri Brahmins eat lamb. Isn't it amazing fact!!!!! Anyways, lets get back to our topic "Kashmiri Roti". I dont know who has invented Kashmiri Rotis but after exploring recipe of Kashmiri Roti, i can say that the recipe has more influence from Kashmiri Brahmins. Why? Because Kashmiri Brahmins cooking is characterized by the use of Kashmiri Red Chillies (called "degi mirch"), fennel, ginger powder and asafoetidia. 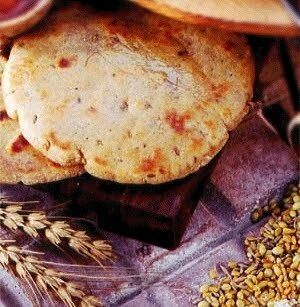 And in this recipe wheat flour is combined with aromatic spices to make these delicious Kashmiri rotis. Please Note : The whole spices used for this roti are roasted and coarsely ground to enhance the individual flavour of each and every spice used. These Kashmiri rotis are so delectable that they can be eaten on their own or with a sweet and sour tomato pickle. 1. Lightly roast the fennel seeds, cumin seeds, ajwain and peppercorns on a tava (griddle). 2. Coarsely pound the roasted ingredients in a mortar and pestle. You can also use Mixer Grinder to grind these ingredients. 3. Combine the wheat flour, pounded ingredients, asafoetida and salt and add enough milk to make a firm dough. 4. Knead the dough well. 5. Divide the dough into 8 equal portions. 6. Roll out each portion with the help of a little flour into a circle of 125 mm. (5") diameter. 7. Cook each roti on a hot tava (griddle), using a little ghee until both sides are golden brown.